Will Diners Fall for Olive Garden’s All-You-Can-Eat Pasta Pass? Branding expert Bruce Turkel and Simon Constable of The Wall Street Journal on Olive Garden selling 1,000 never ending pasta passes for $100. Full-service chains are betting on all-you-can-eat promotions – but industry insiders aren’t so sure these promotions are a deal for the restaurants serving them up. 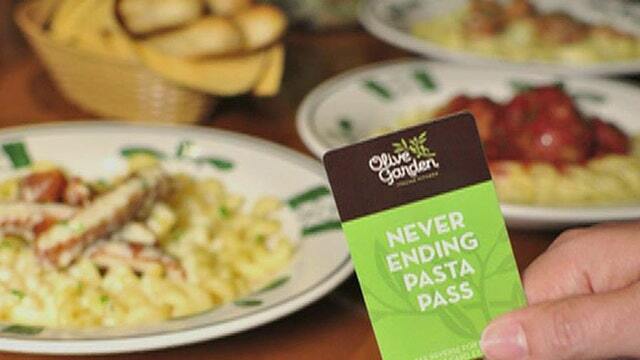 Just two months after TGI Fridays came out with $10 unlimited appetizers, Olive Garden is offering its own “Never Ending Pasta Pass.” For $100, diners can eat as many pasta meals as they want for seven weeks, from Sept. 22 through Nov. 9. The catch? There are only 1,000 Pasta Passes available, with sales starting Monday at 3 p.m. ET. Though the Pasta Pass might be a great deal for spaghetti super-fans, restaurant industry consultant Aaron Allen isn’t so sure Olive Garden is going down the right track. “It doesn’t work well in the long-term. These short-sighted discount-driven promotions … they’re appealing to the buffet-minded consumer, which is not an affluent consumer,” said Allen. He said promotions like these are a desperate attempt for full-service restaurants like Olive Garden to compete with quickly growing fast-casual concepts, such as Chipotle. Indeed, the fast-casual chains are quickly outpacing their more expensive competitors. According to National Restaurant Association SVP of Research Hudson Riehle, full-service restaurants are on track to grow by 2.6% in 2014. Meanwhile, the quick-service category, which includes fast-casual, will grow by an estimated 4.4%. Overall, the restaurant industry is set to do a record $683 billion in sales in 2014, up 3.6% year-over-year. “The customer wants value, but not a discount,” explained Allen. He points out that Chipotle increased prices earlier this year – and saw a spike in overall traffic. “There’s good evidence that consumers are willing to pay more for great service and convenience and value. [Full-service restaurants] can’t compete by discounting, and they can’t be as fast and as cheap as fast-casual,” he added. More in line with consumer preferences, said Allen, is Starbucks. The Seattle-based coffee company announced late last week it will be opening 100 “Reserve Roastery and Tasting Room” locations over the next five years. The Reserve locations will offer a “super premium experience,” according to CEO Howard Schultz, with higher-end coffees available for sale. Along with a smaller footprint “Drive Thru” concept, Starbucks plans to open 1,550 new stores in FY 2014, and 1,600 more the following year. “Starbucks is counteracting the perception that it’s too big and too corporate,” said Allen. “With new prototypes … they are essentially allowing for different experiences under the same core brand.” The Reserve concept also continues to maintain Starbucks’ value in the eyes of the consumer. And Allen said Starbucks’ planned growth is a testament to this strategy, as opposed to cost-cutting or discounting initiatives. “1,500 locations – that’s [nearly] twice as many locations as Olive Garden has in total,” said Allen. Olive Garden, a division of Darden Restaurants Inc., (NYSE:DRI) has more than 800 restaurants. Shares of Darden are down over 11% year-to-date.